I was challenged on Facebook by a fellow author to do a 30 day writing challenge. I read through the challenge list and accepted it, but instead of doing 30 days of Facebook status updates, I am going to make 30 blog posts. If I do one a week, that will be 30 weeks of writing themed blog posts. Day 1 is a one sentence summary of the first story you ever wrote.... Well, in this instance, it will have to be the first story I can remember writing. I wrote lots of stories as a kid, but I can't remember what they were all about. So, here goes: a special girl, called Raina Morning Star, is rescued from drowning and taken in by a merchant family who live in a land where dinosaurs are a common everyday sight and form of transportation. It was a pretty cool story idea, but the plot never took off in my head. I still love the ideas that I had for the dinosaurs, though. I'll put them into a story some day. So, everyone in the blogging world is doing a "year in review" thing. I hadn't planned on it, but then I started looking through my pictures and thought "Ah, why not?". So here we are. Don't worry, this'll be short. My year has been pretty good, overall. Like any year, it has had its upsides and its downsides. Most of the downsides waited to come along until the holidays, though (great timing, right?). The rest of the year, though, has remained pretty uneventful. First off, I started training Pilot to be a trick dog. He has earned his Novice Trick Dog Title, and we have been slowly, but surely, working toward his Intermediate Title. You can watch his trick videos here: Week One Training, Week Two Training, and Week Three Training. He is also planning to become a Therapy dog. He passed the Therapy dog test, but we have yet to make it to any supervised visits. He helped me make a Star Wars doggy costume tutorial for Star Wars Day, which you can see HERE. He and I also kept up a daily jogging routine all summer long! Whoohoo! I am super proud of myself for that, and Pilot of course loved it. Cold weather came along, though, and my stupid lungs cease to function in the cold. So. Yeah. Jogging routine is on pause and the old ball and frizbee have been brought out to play instead. In the Spring, I was able to interview a lot of authors. It was tons of fun, I learned a lot, and I hope to be able to do some more interviews this year. And, no - I did NOT get my second book published this year. It is finished, but not published yet. Read more about that HERE. If you want, you can read a scene (deleted) from the upcoming book. I had a fun birthday. My mom made me a Star Trek cake and my sister got me a Star Trek and a Stargate t-shirt. To end the year with a bang and a bag of lemons, cancer popped up out of the blue and took my grandmother who has been living on our property with us for the last 5 years. She passed away before Thanksgiving. I was really hoping to end the year by going to the theater to see the new Star Wars movie in my Jedi costume, but that didn't work out. I was also hoping to have my next book ALREADY DONE AND PUBLISHED AND OUT OF MY HAIR AND AVAILABLE TO THE PUBLIC BEFORE CHRISTMAS!!!.... oops. Did I just pound that out in caps lock? Oh well. Despite said downsides, 2015 has been a decent year to live. I am looking forward to 2016 though, and I plan to accomplish a lot this year as a blogger, a author, and a dog mom! There are Affiliate links in this post. If you purchase anything through them, I receive a small commission which helps me provide free content for you to read PLUS buy treats for my dog. Please read my full Disclosure Policy. ​ Some people who know me also know that I am hard of hearing. After an accident in the Spring of 2010, I began to lose my hearing, and by December of the same year I'd lost 80% of it. Most people have NO CLUE. I have coped very well with the loss, my sister and mom work with me to help keep my speech normal, and I do a great job at pretending to be normal when I am in public. Yes, I should quit pretending, but people get weird when they realize I have a "disability". Some people like to use it to their advantage, or challenge it, or make fun of it.... and that is how individuals get hurt when around me. I have been considering the possibility of training Pilot to be my hearing ear dog. Two years before Pilot and I found each other, I had a German Shepherd that I intended to train to be my hearing dog. After a most unfortunate set of circumstances, that fell through, and since then I have not had the confidence or the desire to try again. Recently, however, I've been working up the nerve to try again. As a result, my mom bought me a book from Amazon titled "My Ears Have A Wet Nose" by Anne Wicklund. I sat down and was able to read it in an hour and walk away with some new things to think about. It was not at all boring, like I thought it would be, and it did a fine job of answering some of my questions, bringing forward ideas and issues I'd not thought of before, and it was full of outside resources and "help lines". What tasks does a hearing ear dog preform? You may find as you lose more of your hearing that when the dog is with you, it gives you confidence to be outside of your home. You will not feel so tentative because you cannot hear the sounds that normal people hear.... this is true whether you are taking a walk or going to the grocery store. This was an unexpected twist for my husband. The more hearing he lost, he found that if we were in a store together and I turned down an aisle out of his sight, he would start to panic. Until you have a dog that works for you, you will probably not even be aware of this added bonus. Up until now, you thought the dog would just let you know about the telephone and doorbell - but there is so much more. I was actually in a state of shock after reading this part. My first thought was tearfully thinking "Somebody understands how I feel..." (Which is stupid. I mean, DUH, of course someone understands! ), and my second thought was that, after spending so much of my own time researching and learning about hearing ear dogs and how to train them, the thought had honestly never occurred to me that having a trained dog with me, in public and at home, would make me feel safer and more confident. Because, that panic the author mentioned above is real and it is something that I do face every day, not just when I'm out in public. The thought that I could live without having to face that feeling daily, simply by having a dog who plays the roll of my ears, makes me eager. I wasn't eager to work towards getting a hearing dog before, but now I am. On the training, the author goes into the importance of a strong bond between the dog and human, and the stable temperament that the dog must have. It had several good tips for training your own service dog and traveling with it, really simplifying everything and giving you extra resources to study in the case you'd like more information. There are also featured testimonials from other people with different dogs and in a variety of situations, one of which Pilot and I could greatly relate to and which gave me hope for his training (it is currently slow, because he does not generally react to sound). My mom purchased the spiral bound edition of the book, but you can also purchase it in Kindle. I was impressed by how well made the spiral bound is, and I think it will last me a long time (which is good, because I will likely use it a lot). Overall, I would highly recommend this book to anyone who was looking at the possibility of needing or training a hearing ear service dog. It is not overwhelming for the newbie to read and it gives them a great start along with excellent advice. At the same time, it also offers something for those people who are well acquainted with the hearing dog world. I was talking to a gal other night, bragging shamelessly about Pilot. I mean, he's a pretty awesome dog. What is there not to brag about? However, in the middle of my conversation, a thought dawned on me: Pilot is my ideal dog. I have been a "animal foster parent" for several years now and have had a number of different dogs (along with other critters) come and go in my life. All of them were good dogs, in their own ways. Most were not stranger friendly, and some were aggressive toward other dogs and animals. A couple got car sick easily and hated to travel. Despite such "shortcomings", they were good dogs and eager to please. However, none of them were the "perfect" dog for me. What is my "ideal" dog? Well, even I didn't know the answer to that question until the other night. Pilot is an full time extrovert. He likes to go places and meet people, so he's the perfect travel companion and therapy dog. He LOVES kids. Like, seriously, kids rank at the top of his priority list. If he sees kids, he will cry and cry until they come pet him. However, his love of people makes him a horrible watch dog. Though he is a champion sparrow killer, and he believes that he will one day catch the wascaly-wabbit who frequents our yard, Pilot is great with animals. He is always eager to meet new dogs and play with them. Cats are "whatever". Chickens are ignored. He behaves excellent when around unstable dogs, whom he has learned to ignore and keep his eyes on me. His energy level is set at "firecracker" which is just a notch below "force-of-nature". If I do not take him on a walk at least twice a week, he keeps me up at night. The more walks I take him on, the more calm and centered he becomes. One of his favorite things to do is jog. That is NOT my favorite thing to do, but, I jog as often as possible, just for him, because I love him. I am planning to get a bike, and I have no doubt that Pilot will enjoy biking as much as jogging (and so will I). All that energy translates into mental energy as well, and I have found that teaching Pilot new tricks is nearly as important as taking him on a walk. He learns knew things quickly and retains what he learns. Up to date, he knows 20 different commands and tricks, including "roll out a rug with your nose", "wipe your paws", and "play dead". Also, my schedule is pretty much non-existent. It is crazy and unpredictable. Thankfully, Pilot rolls with it. I've no doubt that he'd like a predictable schedule better, but he is clearly not a dog that has a great need for it. Yep. Pilot is my ideal dog. And to think that he was a skunk-smelling roadside drop-off that some cowboy found and put in my truck. You may call it good luck, or happenstance, or whatever, but I call the whole thing a God-send. Before you leave: I've started a animal centered link up called "The Pets & I Critter Hop". My plan is to post the link up every Monday. If you have any blog posts concerning animals - pets, wildlife, funny stories, tips, item reviews, or even just pictures - please link it up below! It is my hope that this link up will grow into something pretty popular where people will come to find lots of amazing stories, pictures, and helpful tips. Okay, kids, time for some Bible fun. Rosh Hashanah is coming up soon. It's September 14th. What is "Rosh Hashanah", you ask? It's the Feast of Trumpets! Feast of Trumpets? What is that? Is there food? Well, read on and find out! When the Children of Israel were wandering the desert for 40 years, dreaming of milk and honey, the LORD told them to set aside certain days and weeks for HIS special occasions. He knew that humans were party animals, after all, He made us that way, so He made special parties for us to throw that would glorify HIM (instead of those weird parties where people get drunk and throw up on each other and lose their memory). One of those parties that God made was the Feast of Trumpets. What is "Feast of Trumpets"? In Jewish tradition, it is believed that Feast of Trumpets is the day that Adam, the first man, was created. So, it is the mark of the Jewish New Year. It is also tradition to celebrate the occasion by eating apples and honey, pomegranates (YUCK! ), and round challah... that is pronounced "KA-la". Say it like you're trying to clear your throat of mucus. Anyway, the Lord God didn't say to do any of that in Leviticus. In fact, He went into seemingly very little detail on the matter. He just said to observe the day by chilling, blowing trumpets, and playing with fire (Mwahahaha!). God also told his people to observe Passover, as well as Yom Kippur and Sukkot - Day of Attonment and Feast of Tabernacles. I'll be going into those later, but you can read about "Yom Kippur" in Lev 23:26-32 and you can read about "Sukkot" in Lev 23:33-43. 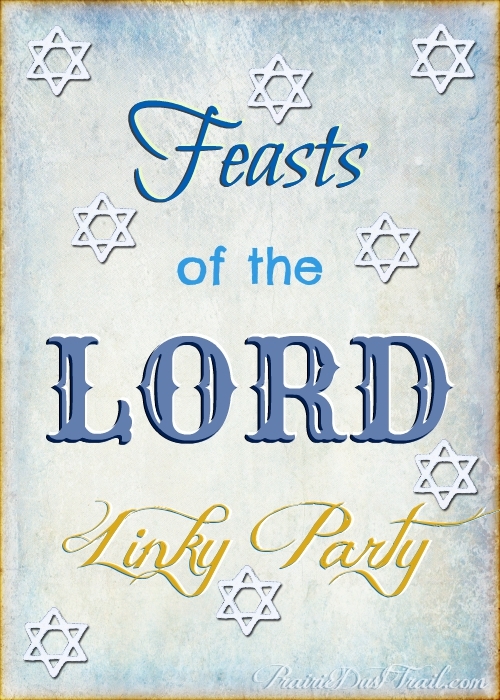 In fact, you can read about all the Feasts of the Lord in Leviticus 23 (except for Hanukkah, Feast of Dedication, and I'll explain that later). How do I celebrate Feast of Trumpets? Well.... I like to wave at it as it goes by. Yes. I usually forget about it. At least you can't call me legalistic, can you? (BTW, if you ever, EVER call me legalistic.... I will laugh so hard, and so long, you will become very uncomfortable, even from the other side of your computer screen). Sometimes, when my family remembers it, we will eat apples and honey together, chop up a pomegranate to throw out to the chickens, and attempt to make challah, which is braided bread. Yeah... You braid the dough before you bake it. Yeah... Our braid usually looks bad. The bread is usually eatable though. We also like to blow our trumpets... or attempt to blow them. We don't have a shoffar, which is the horn traditionally used for Jewish feasts, but we have other wind instruments. For your viewing pleasure, I have put together a video of the kid's most recent attempt at "tooting their horns". 1. What thing in particular makes westerns appealing to you? Faith: All of it! The ruggedness, the danger, the flexibility, the shootouts, the romance, the multiple redemption possibilities, and so much more. Sorry, I can’t pick just one. 2. Where did the idea for Hymns of the West come from? Faith: It came after I had a beta-reader ask what the next book in the series was about. I wasn’t even planning a series, so I told him there wasn’t a second book. But his question got me to thinking and I eventually came up with the ideas for six or seven books in the series and I am now considering connecting this series to a contemporary fiction trilogy I have ideas for. We’ll see where that goes. As for the name of the series, that came when I decided to make all the novel titles hymn titles. And since they’re all Westerns, Hymns of the West works perfectly! 3. What’s something about yourself that really annoys you? Faith: My forgetfulness. I forget things way too easily and sometimes that is a very, very bad thing. 4. What’s the name of a book you’re reading? Faith: “Heaven” by Randy Alcorn. It’s a shortened version of his full-length book by the same name. I haven’t read much of it yet, but it is good. Faith: Bonanza. There’s just something about those Cartwright boys that Gunsmoke doesn’t have. I like Gunsmoke as well, but not as much as Bonanza. Faith: To encourage and challenge Christians in their walk with God and to hopefully reach some non-Christians for the gospel as well. 8. What’s the last song you listened to on purpose? Faith: Franz Schubert’s Impromptu Opus 142 number 2. It was on a CD I was listening to and I skipped ahead to it because I didn’t remember which one it was. 9. What is your favorite salty treat? Faith: Dill pickles. They’re about the only thing I like that has a lot of salt. Even with potato chips, I prefer the no salt chips rather than the salted ones. I’m weird that way. Faith: Jokes. Sometimes. Other people laughing hysterically and unable to stop. Things like that. 11. Who’s your favorite cowboy movie star? Faith: John Wayne all the way. Can you get anymore cowboy than him? 12. You just walked in the door after a long day. What do you do first? 13. Here’s a free plane ticket! Where would you like to go? Faith: Scotland! Or Montana, but I could, conceivably drive out there someday, so yeah, I’d pick Scotland. I’ve always been fascinated by Scotland. Of course, since I have some internet acquaintances in Ireland and England, I’d probably try to get there as well since I’m on the island. 14. Before we end, would you tell us a little about each of your books in the Hymns of the West series and what inspired each one? Faith: A Mighty Fortress is about Joshua and Ruth Brookings and their encounter with Jed Stuart. It’s a story of trust and redemption. The idea for this story came from a picture and a short story contest. I was too old for the contest and the idea I had was too long for the contest anyway, but the picture inspired me to write this novel. Be Thou My Vision is about Jed Stuart’s sister, Anna, and how the events in A Mighty Fortress affect her life and change it completely. Be Thou My Vision came about when I decided to write Anna’s story. Amazing Grace is a continuation of Be Thou My Vision, but from Caleb Stuart’s perspective. After finishing one of the drafts of Be Thou My Vision, I knew I had to write Caleb’s story. Since Be Thou My Vision is in first person, I couldn’t do his story in there, so I wrote Amazing Grace. You know, once you spell "happiness" so many times, it starts looking like a really weird word. It starts sounding weird too. One time, a friend asked me "What does happiness mean to you?" That is a really in depth and broad question. The term "happiness" can cover so many different things on so many different levels. But, when my friend asked me, I didn't need to think long to find an answer. People tell me all the time that I am such a happy person, that I light up the room with my smile, and that my happiness is contagious. I get the feeling that they often wonder how I do it. Well, it's not my fantastic personality, I can promise you that. It is simply because I AM happy. To be truly happy, does it mean that you have a perfect life? To be happy, do you have everything you want in life? Does a happy person smile all the time? So, what does happiness look like? True happiness results from contentment. When you are content with where God has put you, with the life He has given you, then you will find that you are happy. Whether you believe in God or not, if you learn to be content with where you are at in life, with who you are, then you will automatically find happiness. Trust me. Been there, done that, have a t-shirt. Often, we believe that, to be happy, we need to "make more", "do more", or "be more". I have tried joining missions, only to have a road block thrown in front of my face. I have created kids missions just to watch them fall through. I have made an effort to improve my community only to have it thrown back in my face. I have considered marriage, becoming a mom and a wife, but the longing has never taken root in my heart and the right man has never shown up. I have come to the point where I have looked up at the sky and said "What more do you want from me?! What more can I do?!" I have 5 younger siblings. They are awesome. Used to, I thought they were holding me back, weighting my wings down with spit-up and drool and Legos and Tinkertoys. They were pain-in-the-butts and I thought I had better things to do, more important jobs, than taking care of them and cleaning up after them. My siblings are some of the most awesome people on earth (yes, I am biased). I have a ton of fun with them every day! We hardly ever fight. We are best friends. Together, we can build skyscrapers and blow mountains up! It's so awesome! I would have never known the full awesomeness of my family and siblings if I had flown the coop. I have an incredible talent for writing. I have a gazzilion stories swimming in my head, barbarians pounding on the inside of my skull, demanding to be released onto paper. If I were busy with missions, community projects, or kids (mine or otherwise), I would not have realized my potential as a writer. I would never have published a book. My siblings would not be eagerly telling the new friends they make that their sister is a published author. I am still learning my full potential as a writer. I still have a lot of work to do to become better. I mean, at the moment, I only have one and a half books published... not exactly something that is noteworthy. Happiness does not look like a life changing trip to Africa. Happiness does not look like big bucks or a masters degree, your own house and car, or your even your own published book. Happiness is a state of mind that you must choose to be in. Nothing can make you happy, but being content with your circumstances is a daily decision. Just because you are not where YOU want to be, because you don't feel happy, does not mean that you aren't exactly where you should be, where God wants you to be. What your heart longs for is often quite the opposite of what God wants you to do. For me, God kept me in one place because He wanted me to learn to be content where I was at. Once I learned that lesson, I found an open door that I had never seen before, and it led me to a room full of possibilities. No. It is an ongoing learning process. But it is easier for me to be happy, now that I learned the important lesson of contentment. Do I get irritated and discontent? Yep. A lot. I also get depressed, feel like I am out of options, feel restrained and suffocated, and I repeatedly have to put grand ideas and dreams back on the shelf where I got them. But when I stop trying to push my agenda, and take a deep breath and focus on what God has me doing, it gets easier. Sometimes, I even catch a glimpse of a bigger picture that will result if I stay where God has planted me. It is simpler said than done, but it is that simple. Your calling may be sitting right in front of you, like it was for me. Does this mean you need to stop looking for opportunities? Possibly. God has this cool way of dropping stuff into my lap. Maybe He wants to do the same for you? Or, maybe He wants to whisper the plan into your ear, but how can He do that if you are struggling with Him? The run down is this: a happy person is a person who is content. Contentment is a choice that the person must make. Ambition and goals in life are good, but sometimes we just need to stop and take a look at the garden we have been set in, just to make sure we aren't missing a chance to smell the roses. I would like to announce that I am going to start hosting a monthly linky party starting January first! What is a “Linky Party”? Well, let me explain and then I will tell you all about the one that I plan to throw! 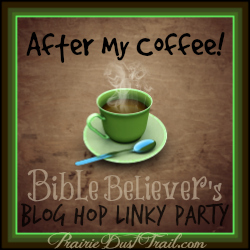 A linky party is when I, the host, post a special html code in my blog post. This code puts a special link at the bottom of my post that you, a blogger, can click. At the bottom of the post, you will find something like this. When you click the link, you will have the option to put in your specific blog post url, some of your information, and a picture. Then you click the GO button. A little picture tile and a link to your blog post will show up beneath my post where other people can find it. Visitors can then click your picture tile and travel to your blog with ease! What this means for you is: more viewership, more clicks, more likes, more subscribers, etc. etc. etc. Most linky parties are themed. You must post a link to a blog post that is about something specific (i.e. book review specific, science fiction specific, sewing specific, etc.). Other linky parties just let you link whatever you like. And each linky party has a different time duration. Some parties are once a week. Some are open one day only. Others are once a month. Others still are quarterly. Take mine for example: it is NOT themed, it is going to be monthly, and it will only be open for other bloggers to post their links in for a couple of days. Now that I have explained that to you, I will tell you about MY linky party! I have this special joke with my friends. On the first day of every month, we try to be the first person to tell everyone else “White Rabbit!” (though sometimes it comes out "Pink Elephant", "Red Robin", and other random stuff, but that's beside the point!). This started when we were interns at Character First! Education in 2010. What it means and how it started I have no idea, but it has been so much fun to poke each other with it each month (when we remember). I decided it would be really neat to start off the New Year by setting up a monthly linky party built around the white rabbit joke: at the beginning of every month, everyone will have a chance to post something new and have it noticed. So, White Rabbit link party, here we come! FOCUS: The focus of White Rabbit Linky Party is to draw attention to new content on active blogs. HOW IT WORKS: I will make a blog post on the first day of the month with the White Rabbit link at the bottom for you to link up to. The post you link up must be NEW. I don’t want it to be any older than 48 hours old! You can make a blog post the day before and link it up, but anything older than that will not be accepted. WHEN: I will have it open for two days: the 1st and the 2nd of each month. I will try to open it at 8-9am Central time on the 1st. CONTENT: Any post you link up must be CLEAN and FAMILY FRIENDLY. No cussing, no adult content, no people-bashing... Other than that, you can post whatever you would like: Book/product reviews, interviews, personal thoughts, How-To, writing focused, home school, devotional, or whatever. As long as it is clean, it goes! SHARE: Since the focus of the White Rabbit Linky Party is to draw attention to other blogs, I require that you share and comment (if possible) on another person’s linked up blog. This does not take much time and, if you do it, your chances increase for someone else to come look at your blog. Plus, it helps draw attention to the other person's blog, which is just a nice thing. I hope any bloggers, writers, and readers who read this will join me in the "White Rabbit Link-up" at the beginning of every month. I would love to have each of you link up your content, become more active on your blog, and get new followers!